This summer has been a busy time in the Mortola Library making improvements for the start of the Fall 2017 semester. 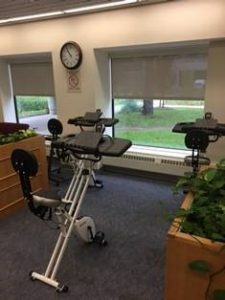 As a part of the new Campus Wellness Initiative, we are making three FitDesks available so that students can keep active while studying. We will also be increasing the therapy dog visits to every other week during the semester instead of just at the end of the semester. 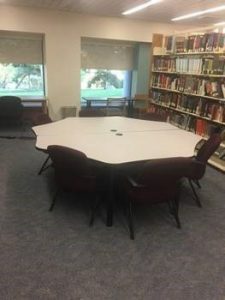 During 24/7 exam time in December, the library will have cots available as napping stations to help improve sleep options for students. In terms of the library building itself, new blinds were installed during the summer along with and new computer chairs. 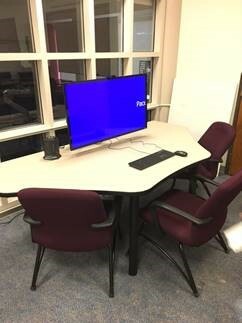 Utilizing previously collected space use data, the library also created two new computer collaboration stations for small group work and added a large collaboration table that will seat 8 people. We’re excited to have everyone back and look forward to a great 2017-18 academic year!